The following is the process I found to set-up the pass-through of the very common USB TP-LINK TL-WN722N Wifi adapter (which is known to work well with Linux) to a Virtual Host Kali Linux 1.1.0 (same process for 2.0) guest, by-passing the Linux Mint 17.1 (Rebecca) Host. I want to be able to access the internet on my laptop at the same time that I’m penetration testing a client network. I use my phone as a wireless hot-spot to access the internet. The easiest way to do this is to use the laptops on-board wireless interface to connect to the phones wireless hot-spot and pass the USB Wifi adapter straight to the guest. Taking the following statement: “The preferred way to get Internet over wlan into a VM is to use the WLAN adapter on the host and using normal NAT for the VM. Passing USB WLAN adapters to the guest is almost untested.” from here, I like to think of more of a challenge than anything else. It can be however, something to keep in mind. if you’re prepared to persevere, you’ll get it working. The first four hex digits are the Vendor ID and the second four hex digits are the Product ID. First of all you need to add the user that controls guest to the vboxusers group on the host so that VM’s can control USB devices. logout/in of/to host. Install the particular VirtualBox Extension Pack on to the host as discussed here. These packs can be found here. If you have an older version of VirtualBox, you can find them here. Don’t forget to checksum the pack before you add the extension. 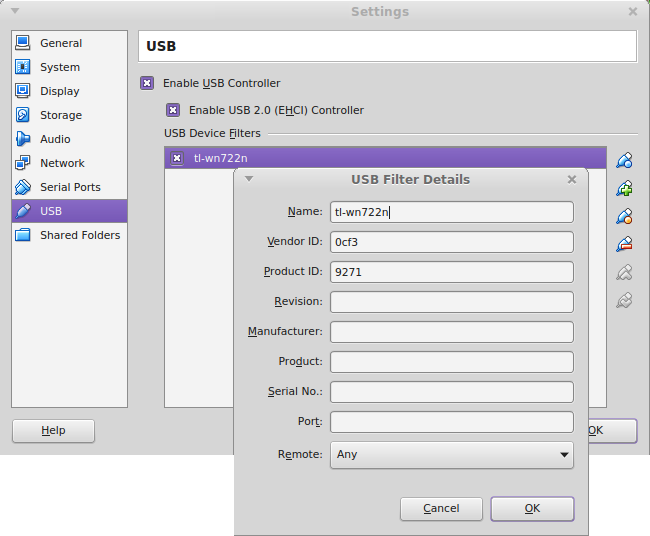 Now go into the settings of your VM -> USB -> and add a Device Filter. I name this tl-wn722n and add the Vendor and Product ID’s we discovered with lsusb. Make sure The “Enable USB 2.0 (EHCI) Controller” is enabled also. Will probably be 0.44kali whether you’re on Kali Linux 1.0.0 or 2. 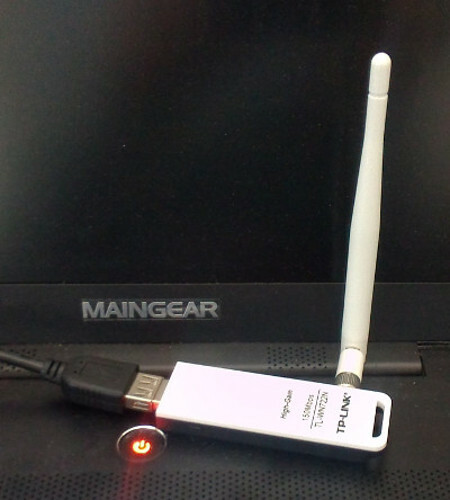 Plug your Wifi adapter into your laptop. In the Devices menu of your guest -> USB Devices, you should be able to select the “ATHEROS USB2.0 WLAN” adapter. You should now be able to select the phones wireless hot-spot you want to connect to in network manager.